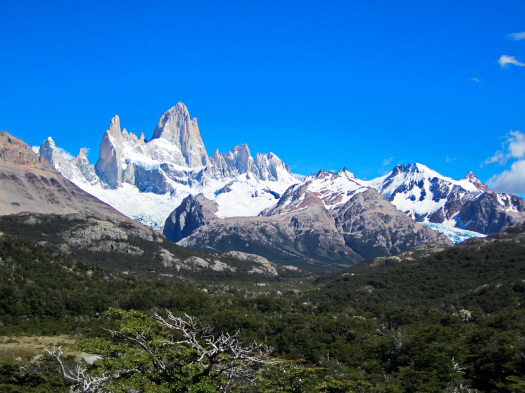 A photo update of recent adventures around the mountain town of El Chalten, home of the famous Fitz Roy and Cerro Torre peaks. For my birthday we hiked 23km (14 miles) from the town of El Chalten to Lago de los Tres at the foot of the stunning Fitz Roy mountain. 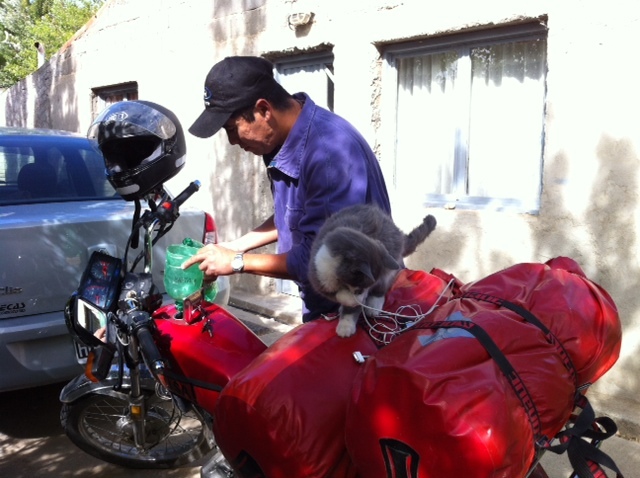 It was exactly one month and 4,500km (nearly 3,000 miles) after we started our journey from Santiago, Chile on January 7th. 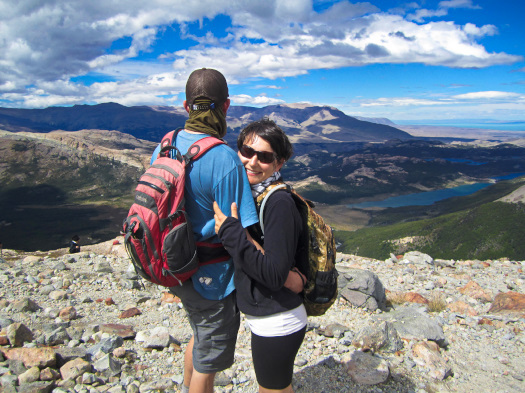 By February 7th we were in dire need of a serious leg stretching, and the undulating ridges and valleys on the way to the mountain were beckoning. But take it from me: hiking boots are not broken in just because you’ve warn them on your motorcycle for a month! My feet are still suffering the blistering consequences. 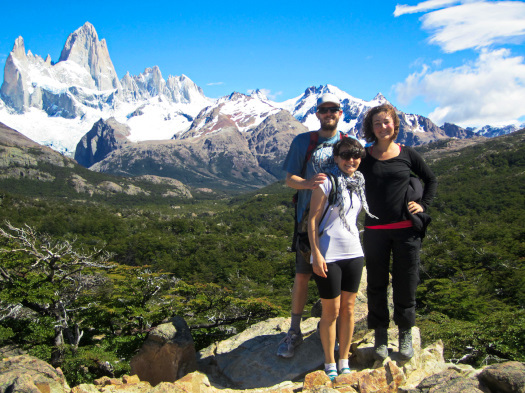 El Chalten itself was a nice town full of good cafes, restaurants, stunning views and rock climbing. I regretted my decision to leave climbing shoes and harness at home, but a minimalist can only fit so much on a motorcycle. It also had free National Park access, excellent and cheap campsites and hostels,making the $30/day budget a breeze. 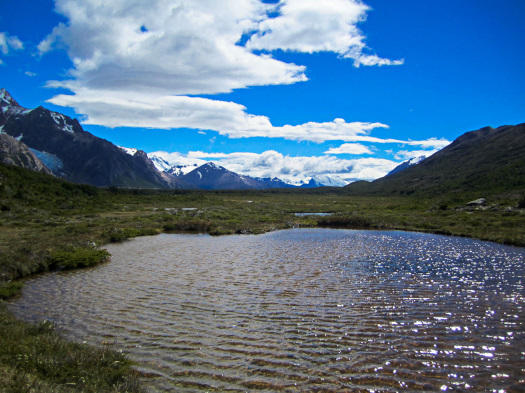 Crossing a valley in Parque Nacional los Glaciares before reaching the mountains. Glaciers glimmer in the distance. My birthday “cake”, a gift from a local baker. Gang of ’84 members Kath and Rob, two weeks after their 9th anniversary. With 11 more months to roam the world, they’re just at the beginning of their journey. The Gang of ’84 unite! …And a mob of identical kittens. More played in the garden. Wow! 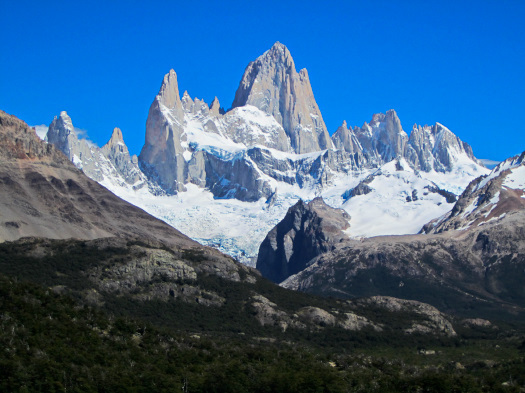 Incredibly beautiful mountain peaks around El Chalten, and amazing that you can manage this trip on $30 a day. Hope you have enough to eat and to give you energy for your road miles. Amazing mountains. Glad you had a nice birthday!